The AI revolution maintains Moore’s Law for continuously doubling capacity at half the cost. New computing algorithms are routinely unearthing new cause/effects relationships. Traditional medicine is practicing the reverse of Moore’s law. It costs twice as much to get anything through to market for marginally better results. In pain relief, runaway costs (= U.S. military budget and rising) only achieve an opioid epidemic, declining life expectancy, and little pain relief. As computer engineers, the current algorithm doesn’t make sense because it requires the presence of an active intervention. How can pain ever end that way? · Converge on resetting relief to continue without the intervention - Homeostasis? 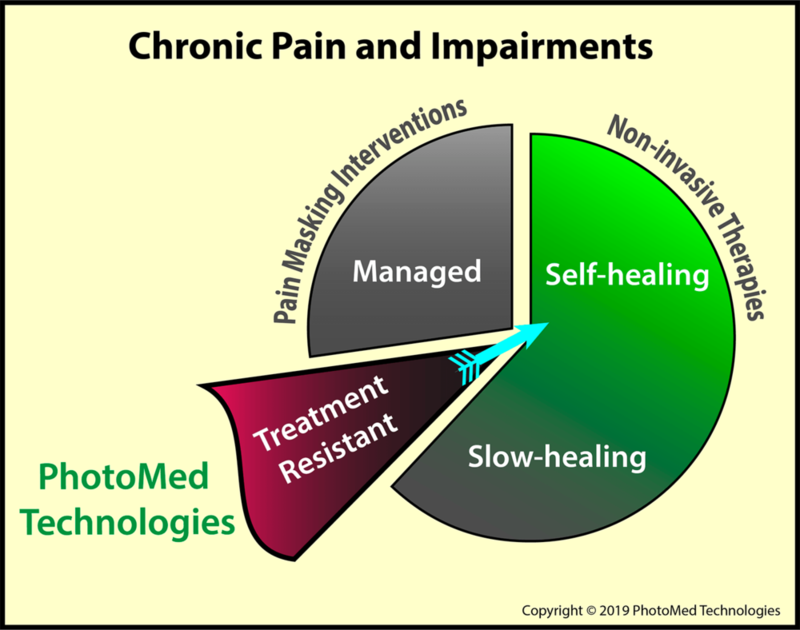 Problem: Chronic pain frequently includes persistent abnormal skin temperatures suitable for algorithmic feedback. Input: Computerized thermal imaging provides real-time feedback to the operator to adjust the therapy during the visit. What is different about the PhotoMed device?